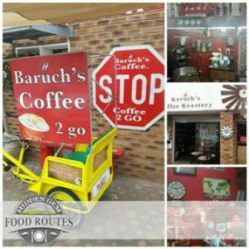 Visit Baruch's Coffee Shop and enjoy the cozy atmosphere with a freshly brewed gourmet coffee. See the roasting process unfold and visit our special garden where children are always welcome. Taste our freshly prepared delicious Israeli Cuisine, rotated to keep the menu fresh.The taste of the food come from different countries of the Mediterranean, example dolmades from Greece, falafels from Lebanon Egypt, Israeli salad from Israel as well as Humus, Chicken Jewish soup, Babaganosh (Brinjal paste)Greece, Moroccan Carrots from Moroccan, Olives from the whole Mediterranean region, Brinjal Cake which Baruch invented with Mediterranean ingredients, Lamb and Humus, Israeli Chicken Snitzel which is traditionally Israeli with sesame seeds, scrumptious cakes and much much more. We make our own homemade chili's. 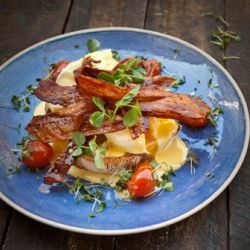 Four and Twenty is both a Cafe and a Pantry: we serve classic breakfasts (and a few not-so-classic for fun) and have a hand-written blackboard lunch menu that changes every week! 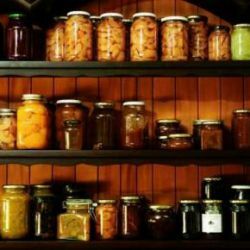 The cafe is complemented by a Pantry with local produce, home-made deli items, artisanal pantry-fillers, fresh daily pastries and hand-crafted confectionary. A part of what we believe makes food truly decadent and special, is when one gets a sense that a lot of time and love was poured into it and this has become a part of our mission statement. We are dedicated to seasonality, sticking to local produce and combining only the freshest, most sustainable ingredients into something that is both gorgeous to look at and mystically delicious to eat. We want every single bite in our shop to be a declaration of our love for good, wholesome, skilful and truly delectable food.